The Pride team celebrating at our Christmas party. 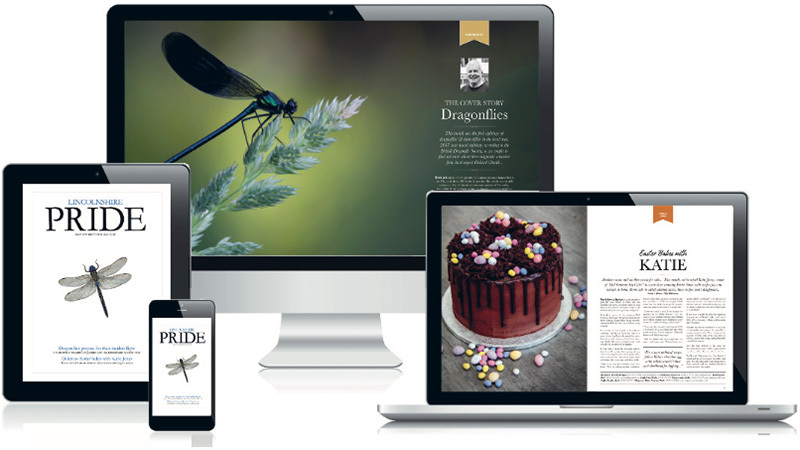 How do you create Lincolnshire’s finest magazine? It’s as easy as one, two… ten. At least, it is when you’ve a team as committed to the job as we are. Celebrating our 200th edition, we thought we’d share a little behind-the-scenes information on how the team creates Pride each month. Perfect planning! 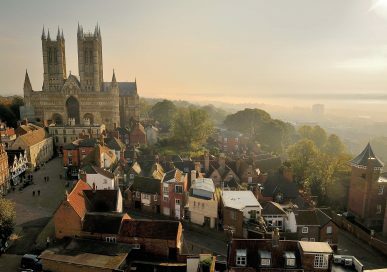 I have a favourite saying, a quote by Lincolnshire’s own John Ruskin. “Quality is never an accident, it’s always the result of intelligent effort.” That’s why the Pride teams working on our portfolio of county magazines all share responsibility for the quality of the magazine. Every member of staff is encouraged to offer ideas for features in our production meetings. It’s important that we all take ownership of the magazine, so that it’s a product we’ll be proud of when it comes back from the printers. ‘Flat plans’ become a way of life… Known as a dummy, flat plan or thumbnails, every newspaper or magazine creates a map of the edition before beginning work. Creating a map allows our editorial and sales teams to each know how many pages they have, what features will run, where they’ll be positioned and where adverts will be placed around them. Our flat plans always separate out our larger features and our homes, food, fashion and motors sections to ensure there’s a good mix of content in every edition. Looking after our clients… As a magazine publisher I steer the ship. My staff in our advertising sales department are dedicated to making and maintaining really good relationships with our clients. Once we’ve a relationship with a client we need to ensure their advertising always gets a good response to ensure that relationships lasts for years. Our sales team last year increased our advertising sales by £250,000 – the best increase in our history – but that would mean nothing if we were complacent. Instead, we value our customers and make sure their advertising works for them in order to ensure we’ve a great relationship with each other year after year. They work really hard for our advertisers, visiting them face to face, making sure our clients remain happy. Creating our content… Once the content of each of our editions has been finalised, our editorial teams set to work making appointments to see the people we want to interview, visiting clients and writing copy. Within this magazine alone are 30,000 words and 435 images! Camera, action… One of the most important elements of a magazine is its images. We’ve invested thousands of pounds in the latest Canon digital camera systems. Having taken our images, our digital darkroom systems allow us to retouch, adjust colours – and yes, airbrush people – using Photoshop when they request it too… with a few clicks of the mouse we can take years off someone! Last year, we also invested in a drone to allow us to take aerial photographs and video footage too. It’s enabled us to get some really unique shots of the county. 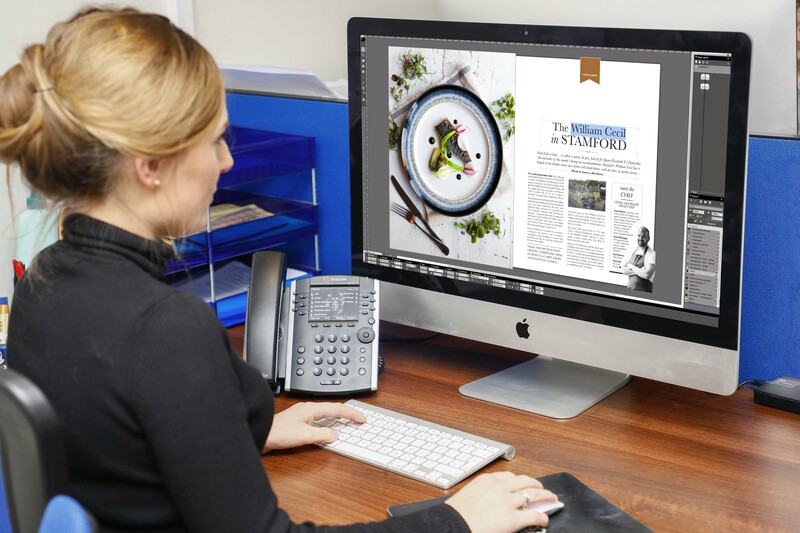 Making up our pages… We use the latest version of a state-of-the-art desktop publishing package known as QuarkXPress to create our pages exactly as they appear in print. Our software not only gives us tremendous control over our text and photographs, but also enables us to check for any pre-press errors like problems with colours before we send the pages off to our printers. Creating our advertising… Of course, our editorials are only part of the story. We’ve a very busy artwork studio, headed up by Mandy Bray, which is responsible for co-ordinating the flow of advertisers’ copy, ensuring that nobody misses an edition and that all of our adverts appear correctly. Creating a good advertisement is a real art. They’ve got to look great, but also work well commercially, conveying information accurately and representing a client’s brand. The team created over 4,000 adverts last year! A pressing engagement… A modern press hall is very impressive. Our magazines are printed on incredibly sophisticated Heidelberg presses which operate at breakneck speed in a 24-hour operation. Even so, it takes a week to print, collate, then finish and deliver the magazine. 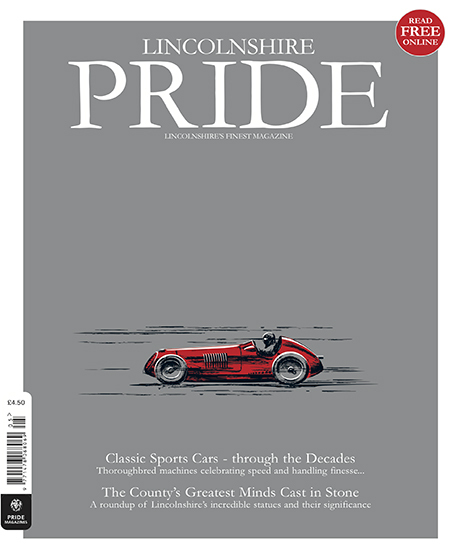 Many copies are mailed out directly from our printers, including those delivered to the top three council tax banded properties across the whole of Lincolnshire, whilst others are sent directly to magazine wholesalers to be sent to over 500 independent newsagents, and to the regional distribution hubs of supermarkets like Waitrose and Tesco, or Marks & Spencer. Ready for delivery… Once our office copies are returned to us, our distribution manager Joe Proctor and his team are responsible for ensuring the magazines are delivered to advertisers who have requested boxes of magazines for their clients and to prestige motor dealerships, golf clubs, hotels, café’s and waiting rooms across the county. 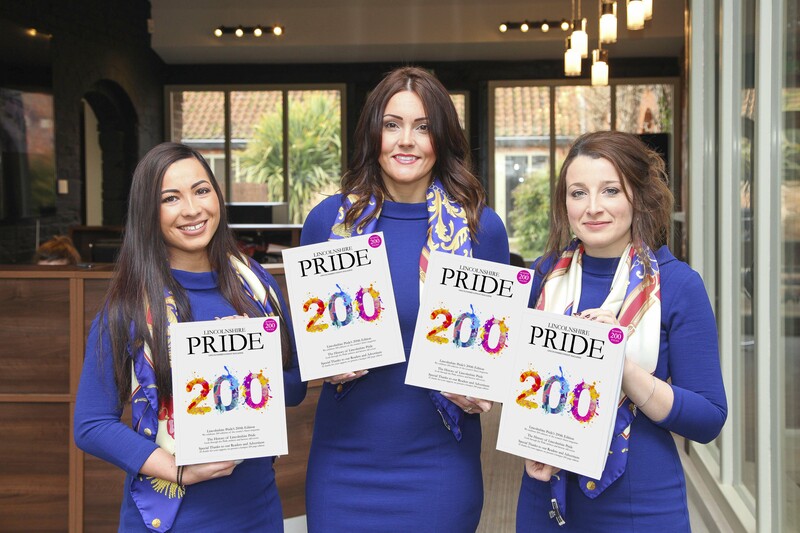 And finally… The best part of the whole process is knowing that at some point, tens of thousands of copies of Pride will drop through the letterbox of the county’s finest homes or purchased in a newsagent and supermarket. That means someone, somewhere will always be enjoying the magazine with their morning coffee or with a glass of wine in the evening! Creating our pages on state-of-the-art Apple Mac systems. Lincolnshire Pride was founded by our Publisher and Managing Director Julian Wilkinson (pictured below), who saw an opportunity to produce a quality magazine which concentrated on the present, rather than the past and one which offered the very best that the county can offer, in terms of its produce, its products and services. 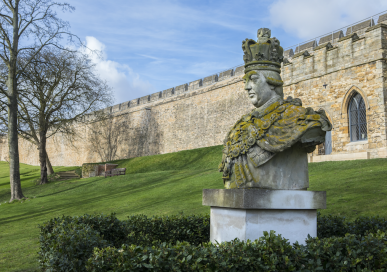 Julian was born in Boston, Lincolnshire and has lived there all of his life. He comes from a printing and graphic design background with over 33 years in the printing industry, 25 of those years as a self-employed publisher. The ambitious entrepreneur works very closely alongside his editorial teams to ensure every edition of our magazine meets his exacting standards. He is also seen motivating and driving his sales teams to hit their targets as well as being a master of Excel, creating his spreadsheets, bar charts and projections (he’s not very often wrong with his planning and calculations!) Under his direction Julian masterminded Lincolnshire Pride’s brand new look; he designed the new covers with unusual but eye-catching illustrations, a new custom paper size and the use of bond paper, as well as gloss paper to ensure all senses are ‘tickled.’ One of his phrases, when passing off the proofs for the magazine, is “If it can be 3mm out, it can be 3mm in.” It is this attention to detail which has helped Pride survive and indeed flourish in such a tough market. Julian also owns UKbride.co.uk, which is the number one wedding website in the UK.